I visited Granada in my early 20s for the first time. After that I was in Granada in the summer of 2002, 2006, 2010 and again this summer in 2017. Granada has a magic that makes me feel at home. I love staying in Albaicin, the old Moorish quarter in front of the Alhambra, old palace & fortress of the Moorish monarchs. Albaicin is a very attractive and exotic neighborhood – narrow winding roads, Cármenes - typical houses in Granada with a garden, a breathtaking view of Alhambra and Sacromonte, Plaza Larga that is full of life. Granada is a special place for me because flamenco is everywhere. You can encounter flamenco – all kinds – all over in Granada: at schools, in tablaos, bars & restaurants, peñas, at plazas, on the streets and even in the balcony. There are many toursits visiting in Granada, and this allows space for many venues and different kinds of performances. And the quality of performances is very good. Today is a full moon. I’m looking at the moon next to Diamond Head and remembering the full moon that I was looking at along with Alhambra a few months ago. I met Ji, one of my flamenco flat mates. She is a sweet and intelligent young woman who has grew up overseas and is studying in Scotland. She frequented Granada and became a good friend of Manuel, a gypsy guitarist who not only plays well but also sings. Through Ji, I got to know Manuel and I was taking some private cante lessons from him. On that day of full moon, he was going to play at a bar called Tacón flamenco. Several of us from the school went with him. He accompanied a young singer named María. 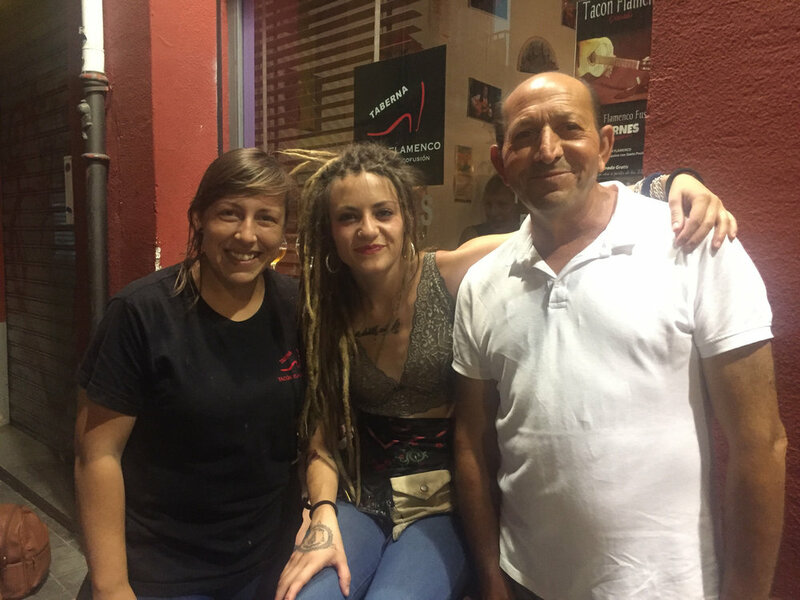 I was a bit surprised because she does not look what I thought of a typical flamenco singer - She has dread hair and tattoos. The lace top that she was wearing looked like tattoos on the upper body. When she started to sing, I immediately liked her. I had an opportunity to chat with her between sets and asked her where her powerful voice is coming from. She told me that it is coming from here, placing her hand on her heart. She grew up in a nearby city of Guadix, listening to Camarón. We felt her love for flamenco in her cante. The small bar was full house, and many had to sit on the floor as there was hardly any space left in the bar. The show was very intimate, and the bar was filled with olé and flamenco energy. After the show, we returned to Albaicin and walked up to the hill in the dark to go to a flamenco peña that has a spectacular view of Alhambra and the full moon. The moment I spent there was private and special. Alhambra, moon, music, good company, and nightly breeze… What an incredible night… What a magical place… I always miss Granada… ¡Olé y viva Granada!